Zone Cleaning lists help me tackle deep cleaning in different areas of my home. I can work on areas over a few months rather than spending a lot of time in one area while neglecting the other areas. 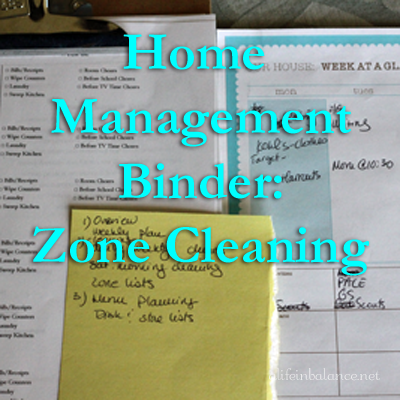 To get started on zone cleaning, give yourself about 6 months to work through the lists. Daily and Weekly Cleaning Lists are the backbone of my regular cleaning routine. Even during busy times, I have a daily minimum to keep the house tidy. Getting the daily minimum cleaning tasks down on paper again in February has been a huge help. I feel like I’m in control of my daily cleaning again. With the daily minimums back under control, it was time to work on my deep cleaning lists for each area of the house. Way too many years ago, I created my zone cleaning lists thanks to the FlyLady. They worked wonderfully when my kids were younger, but over the last year or so as I moved towards electronic planners, I couldn’t find a way to handle my cleaning reminders, especially my zone cleaning online. Essentially, zone cleaning divides your home into 5 zones with one week assigned to each zone. Because I have 3 children’s bedrooms plus other areas beyond the basic zones, I added them to the basic outline to fit my particular homekeeping needs. Once a month, I do the deeper cleaning in each zone. I took the FlyLady’s lists and modified them to fit my needs. Then I created a 2-page yearly list for each zone broken down into months. This way, I would know which months I covered all the cleaning tasks in a zone, which ones I missed because of other priorities, and which had minimal cleaning. I don’t do all the items on the zone cleaning lists. If I can wash curtains once or twice a year, I’m happy. Some rooms need to have their walls cleaned on a regular basis like the kitchen. I’ve never cleaned the basement walls, and probably never will. During some months, I only have a few days at the beginning of the month to clean the dining room zone or a few days at the end of the month to clean the living room zone. Since these zones tend to remain cleaner than the kitchen zone for example, I just catch up with the zone cleaning the following month. For now, I am updating my zone cleaning lists on paper which I keep on my kitchen counter. About 2 years ago, I tried to use FlyLady through Cozi. At the time, the FlyLady lists were static on Cozi; I couldn’t modify them to fit my home’s needs. While writing this post, I found out I can change the lists. While I am happy with my paper lists, I will take another look at Cozi to see if I could use it once I have my lists finalized. My preference is always for electronic planning if it works with minimal fuss and saves me from printing paper. How do you handle your deep cleaning? I LOVE the FlyLady!!! I found it so helpful to break up the house into Zones – so much less intimidating and more do-able! Melissa Angert recently posted..well, hello there, march! I tried the FlyLady and I did find it helpful. Love the idea of breaking the house into Zones. But honestly, I admire how much you get done. I haven’t attempted anything Fly Lady since she essentially made my inbox too hard to wade through in whatever year that was I signed up. But this idea feels really awesome and I’m going to have to consider it! Thank you so very much for this list! I am a young mom living with my parents because they need my help and I need theirs. I have been really trying to pull my weight around the house and I think this will help me a lot thank you! I’m glad I can help! Let me know if you have any questions. I’m in the middle of renovating and decluttering, deep cleaning isn’t really on my agenda just yet but when I was renting it happened every 3 months for rent inspections. Fly lady scared me off with her shiny sink post in the first few minutes of reading her blog. For deep cleaning, I generally just do it when I have time. Being in a smaller house, it’s not too hard. Having hardwood flooring and very few window treatments helps. Also the carpet would fall apart if I tried to shampoo it, so that’s not happening. I tried Fly Lady years ago but it just didn’t work for me. I use Google Calendar now to schedule everything I need to do, from doctor appointments, to daily and weekly cleaning, to blog stuff. I need it electronic because I will ignore anything on paper, but I can’t ignore my phone & tablet beeping at me! Speaking of, my phone just told me it’s time to go shower haha. Hi I’m Sharon from How To Get Organized At Home and I just wanted to stop by and say thank you for linking up. I have tried the zone system and for the most part they work, like you I have had to adapt them to meet my needs and my home.